Snickers recently gave an innovative spin to its regular chocolate bar communication by swapping Snickers with 19 different hanger symptoms. These Hunger Bars, featuring hunger symptoms such as Tubelight, Drama Queen, Princess, Junglee and Laatsaab are in four local languages. The brand’s new packaging innovation is extended by a television, digital & outdoor campaign. It builds upon the brand’s global philosophy of how you’re not you when you are hungry. 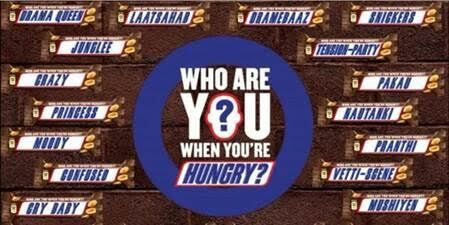 In India, the campaign gets a new spin through the tagline ‘Who Are You When You Are Hungry?’. The campaign will span over 2 months, from November to December this year. Yogesh Tewari, Marketing Director – Mars Wrigley Confectionery, India explained that the purpose is to make these hunger traits part of everyday lingo and is seen as an informal, friendly gifting opportunity is achieved. 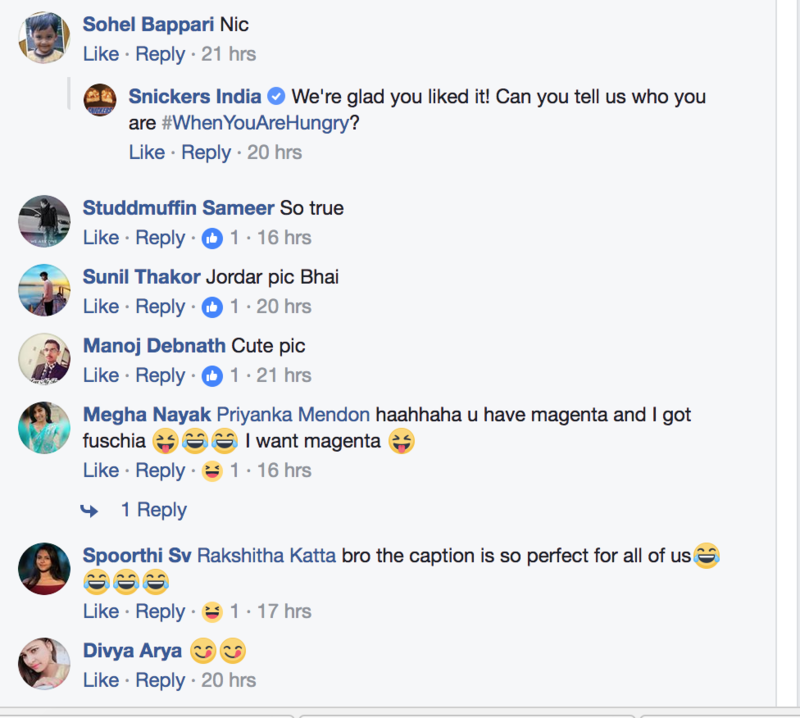 “The content has been made in such a way, that it perfectly resonates with the TG, the use of colloquial language and interacting with the audience in the signature Snickers brand of humour, so that it becomes super-acceptable,” Tewari shared. 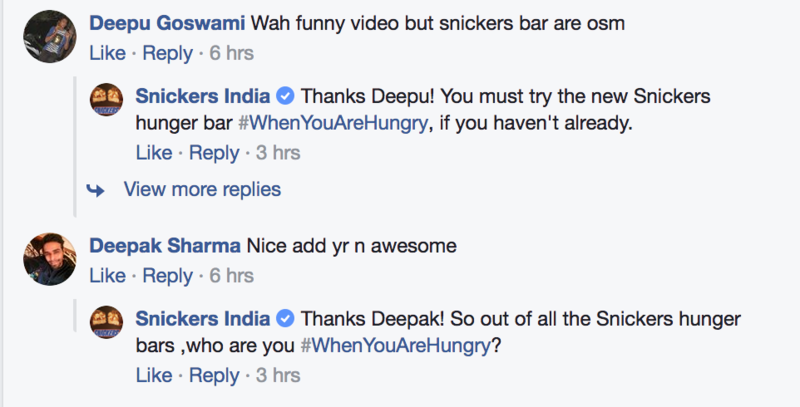 According to Tewari, Snickers’ social media strategy for this campaign is two folds – drive awareness of the on-pack change among the TG through a fun and exciting campaign as well drive new consumption occasions for self and for casual gifting to friends. “The innovative labeling, we feel, is the perfect recipe to make noise on social media. In this campaign, we have used social media to introduce all hunger traits available in the market to TG and to drive new occasions for their consumption either to express yourself or by gifting these bars to friends who act out of character when they are hungry,” Tewari added. 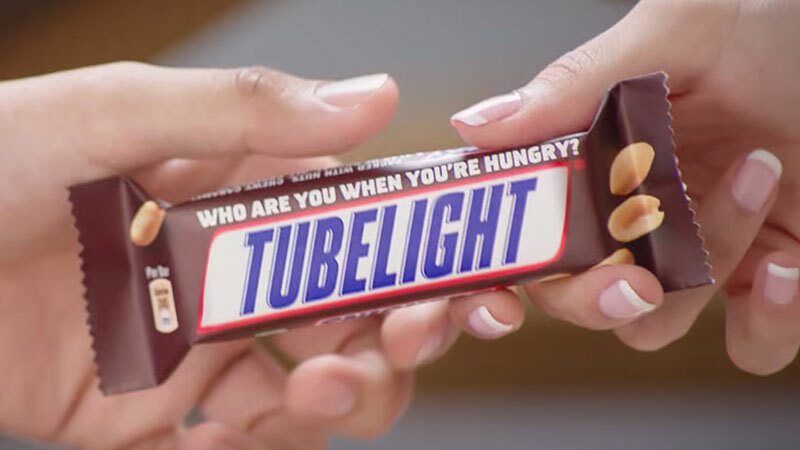 In addition to the three 20 seconds videos, Snickers is also running 6-second bumper ads as well as static social media content on various social media channels. Snickers even took a dig at the Udit Narayan incident in a video which surfaced, where he was found yelling at airline officials and also threatening them. The brand further, ran a contest on Twitter, where it asked users to tweet what happens #WhenYouAreHungry. 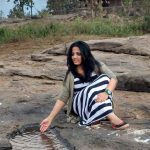 A number of influencers too were seen in participating in the activity. A quick look by Keyhole Analytics suggested that #WhenYouAreHungry received 4,731,366 between November 10 – November 16. People have appreciated the the videos in the campaign. There is a healthy amount of engagement looking at the shares and the comments on the videos. 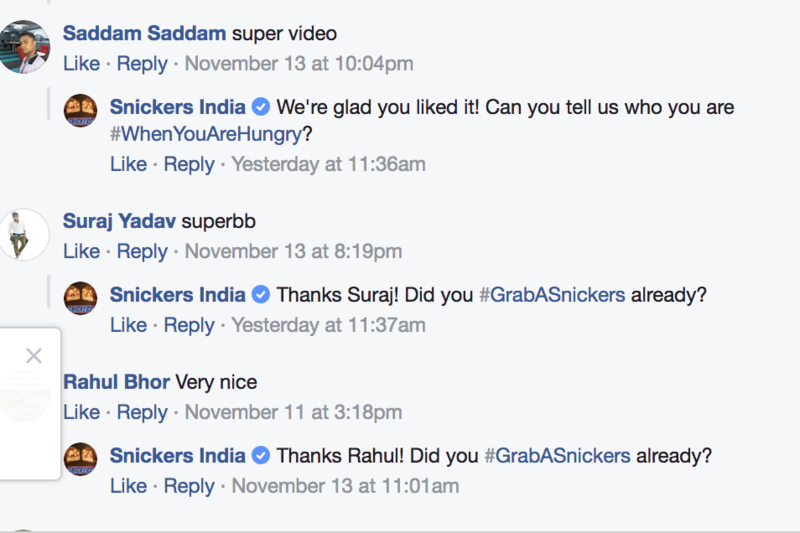 Snickers has not had a very active social media presence in India until now, the campaign is a great opportunity for the brand to revamp their digital footprint.